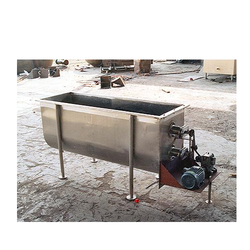 Constructed with stainless steel, can scrubbers are used for cleaning 40 ltr aluminum/SS milk cans. The can scrubber has body immersion tank of 400 ltr capacity and is equipped with two nylon brush suitable for 40 liter cans. Moreover, it comes with a is motor driven machinery with 1 HP, 1440 RPM, 3 phase motor with gear box and driving chain. 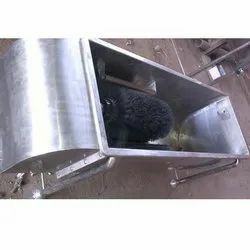 With our years of experience & in-depth knowledge in this field, we are engaged in offering a quality-assured array of Milk Can Scrubber Machine. The can scrubber shall be suitable for scrubbing std milk cans of 40 Liters capacity .the scrubber will have a SS trough .The driving mechanics will have 1 HP 1440 RPM electric motor suitable for operation on 3 phase. Material Of Construction: Mild Steel, Stainless Steel. · The Machine is suitable to Scrub Mechanically both inside and outside surface. · Standard 40Litre Milk cans of 325mm Body dia x 200mm neck dia x 600mm height can be washed. · Robust fabricated 2mm thick stainless steel confirming to AISI 430 with Rigid formed top edge. · Holds a capacity 425 Liters approx in a bath space. Unique Engineers offer supreme quality Can Scrubber that is used for removing unwanted contaminants from the milk. Our can scrubbers are made from genuine stainless steel metal and are free from corrosion and leakage.